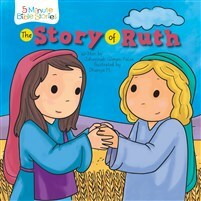 Although Ruth faced sadness and heartbreak in her life, she trusted God and never gave up! Ruth found strength, love, and happiness by working hard and caring for others. In this wonderful story of perseverance, learn how faith and diligence can lead to a life of happiness. Begin your child's lifelong love for reading the Bible by sharing these 5 minute Bible Stories made just for kids featuring characters played by kids.